I am passionately obsessed with candles. I can't help it ... if I see an interesting jar or smell an intoxicating scent, it's all over. I have to have it. To that end, my entire apartment is cluttered with candles. At last count, I think I had about 40 laying around. (And no, this is not an exaggeration.) 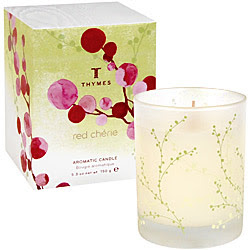 One that I kept staring at but never lit was my Thymes Red Cherie Candle. I've literally had this one for about six months and it remained in its box, just waiting for the day I decided to light it. Now, in all fairness, I don't really light candles in the summer. It's just too darn hot. But last night was an exception ... I turned off the air conditioning for awhile, settled down to read a book and -- lo and behold! -- my eyes fell on this candle. It seemed to be calling to me, just waiting to be unwrapped from its packaging and lit. And so I obliged ... and, oh my goodness, what on earth I have been missing! To start with, the jar is absolutely gorgeous. A leafy vine wends its way around subtly frosted glass, creating an air of tranquility and calm. It's so beautiful, it simply begs to be put on a vanity or dresser in a place of importance. But once lit, wow. The blend of sparkling pomegranate, cherries, passion flower, lychee and fruity musk is simply delightful. It's not too strong or heavy, and doesn't leave my apartment smelling like ripe fruit for days ... instead, it's understated and elegant, the absolute perfect scent for a night spent curled up on the couch with a good book and a heavy down comforter. Even better, this candle burns for up to 40 hours. But now that I feel guilty about not burning it for so long, I have a feeling those hours are going to tick away quite quickly! This candle is no longer available. I have a hard time coughing up $25 for candles but this does really sound divine. I mean, pomegranate, cherries and lychees - I'm in heaven!